This guest post is by fellow Planet Hunter and frequent contributors on PH Talk, Tom (Tom128) who attended the Kepler Science conference. Having just returned home after the “First Kepler Science Conference”, I have some good news to share with our Planet Hunters members. There is a high likelihood for a second conference in two years time, so start making plans to attend. It was simply a high energy atmosphere, cutting edge assembly of some of the best and brightest minds trying to get their heads around what Kepler is doing to astronomy in general and astrophysics in particular which is nothing short of a revolution. Maybe we can call it a singularity of astronomical assets all working together trying to fathom what the Kepler data is revealing. Planet Hunters is one of those assets as Kepler cannot look at each individual light curve. It was a great pleasure meeting with other Planet Hunters such as Meg Schwamb of the PH science team and of course Kianjin and Nighthawk_black. What was originally billed as five half day sessions morphed into eight hour days or more by the start of the conference. Everyone wanted to have their 15 minutes of fame and for good reason. There are some exciting planets being discovered such as Kepler- 22b or the new class of “Heartbeat” stars. Meg did an outstanding job presenting for Planet Hunters and I encourage you all to visit the Kepler site to view her presentation online as well as the other speakers at the conference. You will not be disappointed. My biggest take away from the conference was just how much our work at Planet Hunters is appreciated by the Kepler science team. 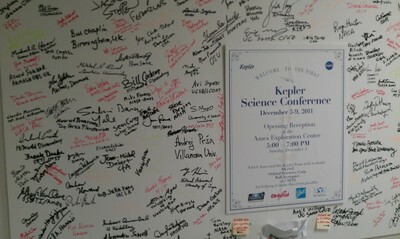 Bill Borucki, who heads the Kepler mission, said that he is thrilled about what Planet Hunters is doing. We heard this theme again and again from many of the Kepler co-team members. Let’s classify some more light curves!